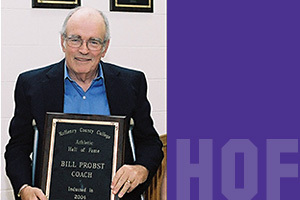 Bill Probst coached the MCC Women’s Basketball team 1989-1997, recording a .740 winning percentage and capturing four Illinois Skyway Conference Championships in the process. Undefeated conference seasons took place in 1994, 1995 and 1996. He coached three NJCAA All Americans in Sue Syljebeck 1994-95, Sarah Kehoe 1995-96 and Davreen Thornton 1995-96. His teams established a record 51 consecutive home game win streak and appeared in the NJCAA Region IV Final Four in 1994, 1995, and 1996. Probst was also named the ISCC Coach of the Year four times. "I have wonderful memories and am very proud of the accomplishments we have all worked so hard to achieve over eight seasons. Being in the first class-first group to go into the Hall of Fame- that is very special," Probst said.